STEM toys are educational toys which teach kids the fundamentals of Science, Technology, Engineering & Math (STEM) through interactive play. From learning to code to developing engineering skills to exploring science, they are a great way to tear boys away from games consoles and encourage them to learn some valuable skills. What’s more, most of the time the toys are so engaging they won’t even know they’re learning! However, with so many toys out there it can be difficult to know what’s best for your child. Luckily, we’ve done the research for you, so read on for our handpicked recommendation of the top 7 best educational toys for boys in 2018 for developing STEM skills. Best for Learning: Coding, Electronics. First up on our list of the best learning toys for boys is the awesome Codrone from Robolink. 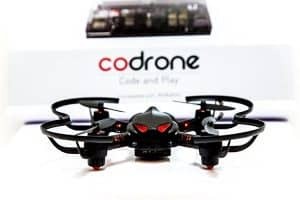 With this set your child can learn the basics of coding by programming flight paths for the Codrone! First you have to assemble the simple controller, then download the software and begin learning to program the drone. This may sound complicated, but it’s made easier with the help of online video tutorials from Robolinks instructors. Featuring flight stabilizing technology and a range of 160ft, the Codrone is much more than just a toy. What’s more, the Arduino coding language is based on the widely used C & C++ languages, so your kid can learn valuable and transferable skills. The only downside is that the battery life is quite short, but this is to be expected for the price. If you are interested in more coding toys, see our article on the best toys for learning coding. If you ever played with Lego as a kid you will know that bringing your creations to life was something often left to the imagination. However, with the release of Lego Mindstorms this has all changed. Mindstorms EV3 is an innovative set which combines the fields of coding, engineering & robotics in an educational format. It’s all about building your own robots, machines and contraptions, but the fun doesn’t stop there. From here you can then use Legos intuitive, icon based drag-and-drop App to program your creations! There’s also the option to step things up with more advanced coding software for PC/Mac. Alternatively, you can control them with a simple remote. This is all made possible with Lego’s revolutionary new EV3 brick, powerful ARM9 processor and other high spec hardware. The set comes with build instructions for 5 awesome robots, but the possibilities for open-ended play are virtually limitless! With tons of idea books and guides available, it’s easy to get things started. 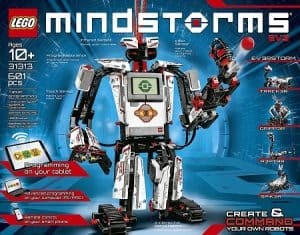 Furthermore, the Lego Mindstorms online community is very active and a full of creative inspiration. Check out the video above featuring some of the incredible things fans around the world have made. 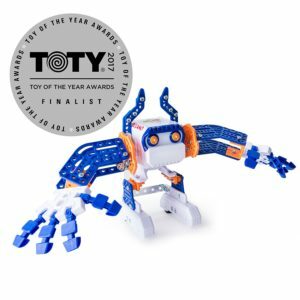 We believe Mindstorms is one of the most important toy releases of the decade and has earned our recommendation as one of the best educational toys for boys this year for developing STEM. Best for Learning: Electronics Basics. The multi-award winning Snap Circuits is an interactive way for kids to get hands on experience about how electrical circuits function. It’s an awesome concept, all you have to do is snap on/off electrical components to the circuit board and watch your creations come to life. 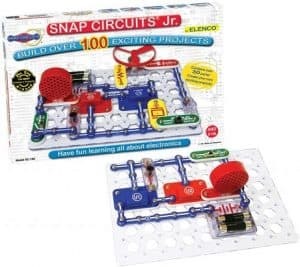 The Snap Circuits Jr. set comes with 30 parts including a musical doorbell, a voice-controlled lamp, a flying saucer, and a light police siren, as well as instructions for over 100 fun projects. Furthermore, if your child gets on well with Snap Circuits there are loads of expansions available. With no tools or soldering required, this set is a great way to learn about integrated circuits, digital circuits, fuses, switches and more! Science just got a little more exciting with the Mind Blowing Science Kit from Scientific Explorer. With 11 exciting activities your boy can learn important scientific principles like acids & bases, solids & liquids and how chemical reactions work. 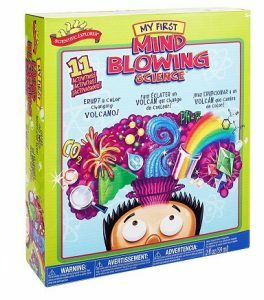 These include creating erupting a changing volcano, creating a sunset in a test tube and growing colorful, jiggly crystals! What’s more, the kit also includes a pipette, test tubes and scoops so is a great introduction to scientific equipment. We love how most of the ‘chemicals’ involved in the experiments are common household ingredients. It shows kids that science is all around and is bound to inspire them. Our list of the top boys educational toys would not be complete without this exciting science toy. Best for Learning: Engineering, Robotics. 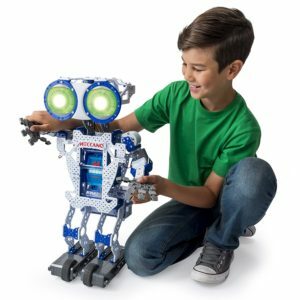 Meccano have been making classic engineering and construction toys for over 100 years, but with the demand for tech and robotics toys increasing so rapidly they risked getting left behind. However, this all changed with the release of the Meccanoid and Micronoid robotics sets. The MicroNoids are the low-end, easiest to build of the kit types available, composed of 139 parts, a motorized module and 2 hand tools. However, the assembly is still quite fiddly so do be aware your child may require help. There are 3 to choose from, each with a slightly different design and color, that can walk, turn, dance and push through obstacles. What’s more, the little robots can interact with each other to race or dance together which is pretty cool! Buttons on the top of the head allow you to ‘program’ the MicroNoids movement. You can also record things and then play them back in the robots voice. Additionally, there are 3 other fun modes: Music – your MicroNoid dances along to the beat, Questions – ask questions and get a yes/no answer, and Autonomous Mode – your MicroNoid does actions on its own. Best for Learning: Engineering, Robotics, Coding Basics. The Meccanoid 2.0 is the intermediate robot with a whole bunch more features. For starters, it’s 2 ft tall, got 6 motors and is made up of over 490 pieces. Furthermore, with over 3000 phrases, games, jokes, facts, questions, voice recognition and programmable light up LED eyes with 500 color options, the 2.0 is way more interactive. It’s like having your own robot companion! Additionally, it also features 3 interesting ‘programming’ options. Firstly, there is Learned Intelligent Movement (LIM) where you move the head, arms or legs to set the motions you want. Then hit the button to replay your programmed movements. You can also attach a smartphone to its chest and program using motion capture – you move and the 2.0 copies. The second programming option is Ragdoll Avatar mode where you control the robot by on the phone app by swiping limbs to move them. Lastly, you can also use the app to program the 2.0 in a drag-and-drop, icon based format. With the 2.0 you get a lot more bang for your buck! The third and final robot in the collection is the monster, 4ft tall MeccaNoid XL 2.0. It has all the same features of the 2.0 and more, with better movement and functionality. 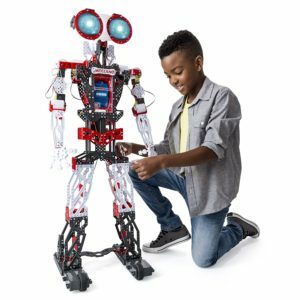 Over 1000 parts including programmable LED eyes with 500 colors plus 10 different motors which power the articulating head, arms and motorized feet! This is basically a bigger and more challenging build than the 2.0, so better for developing mechanical engineering skills. There are also more parts so more potential for creating your own designs. However, if this is not your kids interest then we would suggest the 2.0 over the XL. Looking for more great educational ideas for boys? Check out our winners this year. We have tried to provide a variety of toys here which will give your child a balanced STEM curriculum. A lot of research goes into each and every one of our articles, so we hope you’ve found our list of STEM toys for boys useful and informative. Above all else, we hope your boy/s have an educational, but fun, experience!